Hey yogis! 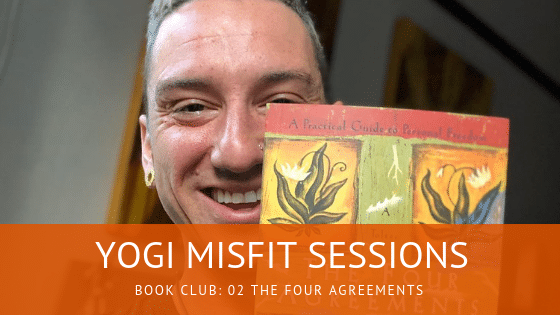 By now, we’ve finished reading book #2 of the Yogi Misfit Book Club, The Four Agreements by Don Ruiz. If you haven’t yet finished it–no worries! Keep on keepin’ on but there are spoilers ahead! This session, I’ve got a few Yogi Misfits on the show. For some of them, it was the first time reading this book, and for a few, the second or third time. We talk about the takeaways from both perspectives. Something that really stood out to me from this book is how you cannot make assumptions, especially where someone is coming from; you don’t necessarily know their life experiences and background that shapes their thought process. Above all, Ruiz lists doing your best. I see this all the time in the classroom–someone gunning to win 1st place at yoga. We also talk about how this applies in our daily lives. Finally, spiritual warriors. What does this mean to you? How does this show up in your daily life? They share their interpretations on this. What were some things that stood out to you? Let me know in the Yogi Misfits Facebook group! Keep up with all book club-related things here. You’ll be joining the rad kula (community) that is the Yogi Misfits. If you like the podcast, please leave a review or rating on iTunes! Click here for a quick and easy guide on how to leave a review on iTunes. Don’t forget to subscribe via: iTunes | Google Play | RSS | Spotify. See you on the mat. Much love and good vibes.